The Human Rights Council of the UN is, as its name indicates, the UN body which deals with human rights. The human rights position of all UN member countries come up before the HRC on periodic review, every four years. HRC has no power over UN member countries. It cannot impose sanctions, but it can pass resolutions on a country, on majority vote, whether that country likes it or not. HRC has three regular sessions per year, in March, June and September. HRC can also hold a special session at any time, to address human rights violations, if one third of the HRC panel requests it. That was how the 11th Special Session of the HRC was convened in 2009 to consider the situation in Sri Lanka, just one week after the conflict came to an end. The Office of the High Commissioner for Human Rights (OHCHR) is a separate body. Its remit is to promote and protect the human rights that are guaranteed under international law and stipulated in the Universal Declaration of Human Rights of 1948. The Office is headed by the High Commissioner for Human Rights, who co-ordinates human rights activities throughout the UN System and supervises the Human Rights Council in Geneva. OHCHR has a list of ‘experts’ given ‘mandates’ to report and advice on human rights of specific countries. There are also the HRC ‘Special Rapporteurs’, about 25 of them, one for each Human Right. These experts serve in their personal capacity, and do not receive pay for their work, which hopefully, ensures their independence and impartiality. OHCHR provides staffing and logistical support for these experts. Over the years, instead of keeping the UN as a skeleton organization servicing the needs of member states and acting as a meeting place for them, the western powers have piled more and more tasks on the UN system and then funded these activities. This has created a great dependency on voluntary contribution to keep the system going. The UN now depends on ten to 15 western countries, and these countries have used the UN to further their foreign policies. In order to retain their jobs the UN officials, starting from the UN Secretary General , have to please these donors. The situation is the same in the HRC. Western countries have a hold on the HRC because they provide most of the funds. HRC is not fully funded by the UN. Other UN agencies have budgets of over billion dollars, HCR had only 97 million per year in 2013. HRC web page even calls for donations. HRC depends on voluntary contributions from member states to carry out its functions. Two thirds of the budget comes from western countries, such as USA, Canada, Norway, EU and their transnational corporations. Since it provides most of the funds, the western countries have much power in the HRC. They control appointments to the HRC and OCHRC. There are unusually high numbers from US, UK, France, Germany, even Italy in the HRC said Pathfinder Foundation. Some junior staff are paid directly by member countries. OCHRC is also largely financed from voluntary funds and staffed overwhelmingly by the donors. All the important staff positions in OCHRC are held by persons from western countries. They make up half the cadre in the OHCHR. The west influences the Office through them. USA, particularly, has invested heavily in the OCHRC and the Office has become a ‘weapon’ of the US, observed Tamara Kunanayagam. Countries have objected to the imbalanced representation in the HRC and OHCHR. Sri Lanka ‘s Ambassador in Geneva, Tamara Kunanayakam had in 2012 pointed out that 80% of the UNHRC’s funding requirements are supplied by powerful nations such as the United States and its allies. Also, key positions in the UNHCR are mostly held by those who have served in the foreign services of such countries. .
Sri Lanka’s position is that this fact is significantly detrimental to the impartiality of the UNHRC activities, especially when dealing with the developing world. As a result, Sri Lanka, along with Cuba and Pakistan, successfully sponsored a resolution seeking transparency in funding and staffing the UNHRC, during its 2012 session. HRC is no longer an exercise in human rights, it is an exercise in geopolitics and superpower politics, said Rohan Gunaratne. Human rights are used by politically and economically powerful countries to target selected countries, said Pathfinder Foundation. The HRC has always directed its spotlight on countries based on its politics, observed Palitha Kohona. The west is using a phony Human Rights campaign over Sri Lanka, said Kamal Wickremasinghe. Sri Lanka’s Pathfinder Foundation observed that the developed countries in the west and the oil rich Gulf countries are rarely, if ever, summoned before HRC. The sole exception to this is Israel. HRC has passed many resolutions against Israel, to the fury of Israel. In 2017, HRC adopted 5 such resolution in one session despite opposition from US and UK. The resolutions brought by the west mainly target developing countries, particularly those in Asia and Africa. The west decides which country should be hauled before it and who should undertake the task, said Pathfinder. Sri Lanka was handled by Canada in the 1980s and by USA and UK today. Certain third world countries have grouped together to counter this. It was this group that supported Sri Lanka during the special session in May 2009, said Pathfinder. There is horse trading of votes at the UN, observed Guardian. One country will pledge to vote for a motion here in exchange for a vote to be on a committee there. There is arm twisting too. The weaker nations are made to vote against their conscience. In the case of Sri Lanka, US got reluctant countries to at least abstain. The countries that refrained from voting made speeches in Sri Lanka’s favor and then refrained from voting, which was their way of indicating that they were refraining from voting only under duress, reported the media. There is a clear polarization of countries in the HRC. In 2016, some member countries of the HRC objected to China, Russia, Cuba and Saudi Arabia holding seats in the HRC. ‘Too many repressive regimes have found a place on the United Nations Human Rights Council, We must vote in countries that they have good human rights records’, said UK sanctimoniously. Unlike Sri Lanka, Cuba fearlessly opposes USA at the HRC. Here is Cuba at the HRC session of 2012. ‘Nothing could better expose the utter hypocrisy of Washington’s “human rights policy” than the anti-Cuba vote at the UNHRC,’ said Cub in 2012. ‘This year, Washington pressured Honduras to “sponsor” the US-authored resolution against Cuba, Honduras had death squads. Even the most vitriolic critics cannot claim a shred of evidence that any death squads exist in Cuba. ‘US arm-twisted dependent countries in Latin America to support the anti-Cuba vote. Among those voting for the resolution were the governments of countries with some of the most atrocious records of military and death-squad repression. Cuba, with a very low infant mortality rate of six per 1,000 live births, universal and free health care, no homelessness, is condemned. But no resolution is passed against the United States for killing thousands of Iraqi people and illegally occupying the country, concluded Cuba. The Office of High Commissioner for Human Rights (OHCHR) has the power to intervene in human rights issues of countries. However, OHCHR is not considered impartial in carrying out its role. The role played by the OHCHR, in manipulating human rights has been a subject of discussion for some time, said Pathfinder Foundation. The credibility, independence and impartiality of the HRC have come into question wherever they are or have been, including in our own region, observed Tamara Kunanayagam. Nepal asked OHCHR to leave Nepal in 2012. In 2009, Algeria criticized the Commissioner’s report on civilians and armed conflict. Navaneethan Pillay had lumped together various conflicts around the world where circumstances differed and used a one size fits all approach. Algeria said it was time to work out the exact relationship between the HRC and the UN Human rights Commissioner. The Commissioner said at the opening of the 32nd session of HRC in 2013 that a growing number of countries are refusing to cooperate with them, but that this will not deter the UNHRC. Sri Lanka found, first of all, that the UN, of which it is a member , was supporting Tamil separatism. In 2005, Kofi Annan, as UN Secretary General had sent a condolence message on the death LTTE eastern province political wing leader Kaushalyan. 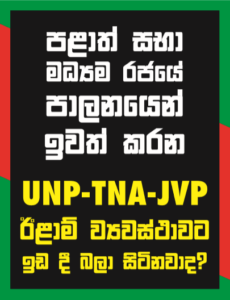 National Bhikkku Front took to the streets in protest in Colombo and marched to UN head office saying this gesture had given diplomatic status to a terrorist outfit. Diplomatic circles had commented on the clandestine links top UN envoys maintained with the LTTE . For instance, V. Nambiar, Under-Secretary-General had phoned KP” in Malaysia. He had been in touch with the LTTE for some time, said the media in 2009. Resolutions against Sri Lanka are not a new phenomenon at the HRC said Pathfinder. Way back in 1987, while the armed conflict against the LTTE was at its infancy, Sri Lanka had to face a hostile resolution in the Commission on Human Rights (CHR), the forerunner to HRC. On that occasion, the initiative to take Sri Lanka before the CHR was made by Argentina at the bidding of India. Sri Lanka had voted in favor of the UK in the United Nations General Assembly on the Falklands issue and Argentina was angry. Sri Lankan delegation spearheaded by late H.W. Jayewardene and Ambassador Jayantha Dhanapala succeeded in amending the resolution and allowed it to be adopted. Sri Lanka found that that the Commissioner herself, was against Sri Lanka . Naveneethan Pillay, a South African of Indian Tamil origin and UN Commissioner for Human Rights 2008-2014, has spoken against Sri Lanka on many occasions. She said that the government of Sri Lanka had perpetrated atrocities in the Eelam war ‘under the guise of fighting terrorism’. In 2009 after the anti Sri Lanka Resolution has been rejected, she had called for an independent inquiry into Sri Lanka. The Algerian envoy reminded her that the Council had already overwhelmingly rejected the call for such an inquiry and nobody had the right to challenge the Council on this score. Navaneethan Pillay had ignored the 700 mosque attacks in Britain but emphasized the 22 mosque attacks in three years in Sri Lanka, said Shenali Waduge. Wikipedia entry on HRC makes special mention of Sri Lanka as a problem human rights case. Starting with 2006, UN dispatched several high ranking officers on fact finding missions. P. Alston, UN Special Rapporteur on extrajudicial executions and Alan Rock ,special representative of the UN for children in armed conflict came in 2006. John Holmes, UN under secretary for humanitarian affairs, Louse Arbour UN High Commissioner for Human Rights and Manfred Nowak, the U.N. Special Rapporteur against torture and other cruel and inhuman treatment came in 2007. Rita Izsak-Ndiaye, Special Rapporteur on Minority Issues came in 2016. Pablo de Greiff, Special Rapporteur on the promotion of truth, justice, reparation and guarantees of non-recurrence, and Ben Emmerson, Special Rapporteur on the promotion and protection of human rights and fundamental freedoms while countering terrorism, visited in 2017. Sri Lanka has been highly critical of these HRC experts. These experts arrive with fixed ideas on Tamil Separatism and they produce biased report based on limited surveys of doubtful validity, observed G.H.Peiris. They had contact with the LTTE. Rock had participated in LTTE festivities in Canada. Louise Arbour met the Bishop of Jaffna and members of civil society in Jaffna. At her request, several such meetings in Colombo as well as Jaffna were without the presence of Government or security officials, enabling her to interact freely. Whenever HRC experts are sent in to review Sri Lanka, the Sri Lanka media and analysts demolish their statements while the Tamil Separatist Movement praises them. Here is recent example. Ben Emmerson, UN Special Rapporteur on the promotion and protection of human rights and fundamental freedoms while countering terrorism” visited Sri Lanka in July 2017. He was openly critical and also threatening. He said that work on the 2015 Resolution seems to ground to a halt. That there was little evidence that perpetrators of war crimes were being brought to justice. If Sri Lanka failed to meet HRC commitments, the international community could use a range of measures increasing in severity, against Sri Lanka .”There comes a point where patience runs out, he said. The media criticized Emmerson heavily, giving much publicity to his statements . Wijedasa Rajapaksa, then a Cabinet Minister had openly disagreed with Emmerson. The United Nations Special Rapporteur on Minority Issues, Rita Izsak-Ndiaye visited in 2016. She said ‘Sinhala-Buddhist majoritarian leadership’ as the main reason behind minority grievances and Sri Lanka’s ‘long civil war’. She also thought that keeping Article 9 of the Sri Lankan Constitution which refers to the primacy of Buddhism, ‘could lead to further suppression of and discrimination against minority religions and communities’. She brought strong charges against the Buddhist majority for construction of Buddhist places of worship ‘in areas that were traditionally non-Buddhist’. It blames ‘Buddhist extremists’ for inciting ‘violence and hatred against religious and other minorities while proclaiming the racial superiority of Sinhala Buddhists’. The widespread destruction of Buddhist places of worship in the island’s north and the east and incidences of aggression, extremism and violence by members of other religious groups towards the Buddhists, however, are not mentioned in the Rapporteur’s Statement, observed Asoka Bandarage. The OCHRC has not finished with Sri Lanka, yet. Louise Arbour, in 2007, wanted to establish a UN mission to monitor human rights in Sri Lanka. This was criticized as a ‘diabolical plan’. The government refused to consider it. It emphatically ruled out the possibility of establishing a UN country office and setting up a field mission in Sri Lanka. The idea of an office in Sri Lanka is back again, though. It is included in the 2015 HRC Resolution on Sri Lanka . The 2015 resolution also allows for the establishment of a permanent Western presence in the form of an OHCHR field office in Sri Lanka, which will have the combined function of investigation, monitoring, and governance, warned Kunanayagam. The field Office will not only assist in obtaining the required material, financial and technical support for implementation of the numerous recommendations, but will also monitor, assess and verify the implementation of the 2015 Resolution, going beyond its General Assembly mandate. OHCHR field offices are fully funded by the rich Western countries, and that most of the staff are directly or indirectly linked to the donors, continued Kunanayagam. The offices are frequently utilized for destabilization purposes and to gain a foothold in countries where a direct Western presence proves politically difficult. There is no doubt that, through the OHCHR field office, Washington and London will take over the entire process in Sri Lanka and, for all practical purposes, the office will become the Trojan Horse that will permit direct US intervention in Sri Lanka, concluded Kunanayagam. The HRC does not hide its bias towards the Tamil Separatist Movement. UN Working Group on Arbitrary Detention which arrived in December 2017 had inspected 30 detention centers and interviews with more than 100 imprisoned persons. They travelled to Colombo, Negombo, Anuradhapura, Vavuniya, Trincomalee and Polonnaruwa. But they were not prepared to visit Commodore D.K.P Dassanayake, held in remand at Welikada, without bail, for six months. ‘He is also an arbitrary detainee, said Dassanayake’s daughter Manjari. This group came to Sri Lanka to investigate arbitrary detainees. They interviewed LTTE people, but not war heroes.